A big dish of creamy polenta is the perfect choice for cold, wintery days, topped with your favorite tomato sauce or a spoonful of slow cooked stew. My family loves polenta, but the traditional way of cooking it on the stovetop is a bit fussy, and requires about 45 minutes and LOTS of stirring. Because of the effort involved, I honestly do not cook polenta that often. 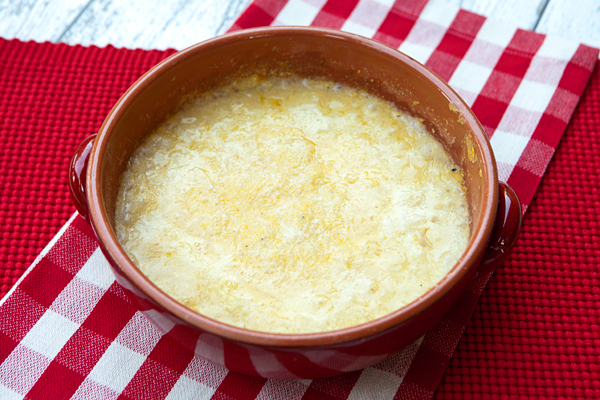 I recently began to bake my polenta in the oven and find it a much easier way to prepare it, and although it still takes a minimum of 45 minutes to cook, it requires only one or two stirrings and you end up with the same creamy polenta that you would if you cooked it on the stove. If you have invited Nonna for dinner, she will not even notice that the polenta was baked instead of carefully cooked on the stove, though she might not approve of this less than traditional preparation method so I would keep that to yourself! 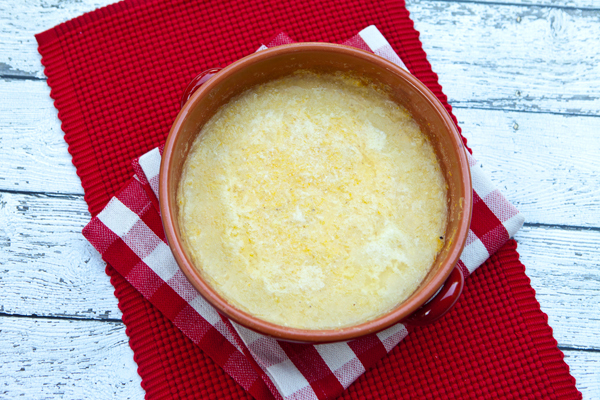 Polenta is so versatile, so do not simply look at it and think “mushy cornmeal”. My family actually prefers it spooned soft into a bowl and topped with a flavorful tomato sauce and a sprinkling of grated Parmesan cheese, but you can cool the polenta on a baking sheet until firm and then cut it into pieces and fry or grill it as a side dish, or cut the polenta (once cooled) into layers and create a lasagna type of dish using meat, sauce, and cheese which is also very tasty. 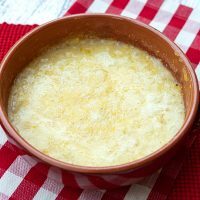 Although I chose to use grated Parmesan in this version, you can replace the Parmesan with Gorgonzola, or even goat cheese, or skip the cheese and simply leave the polenta simple. 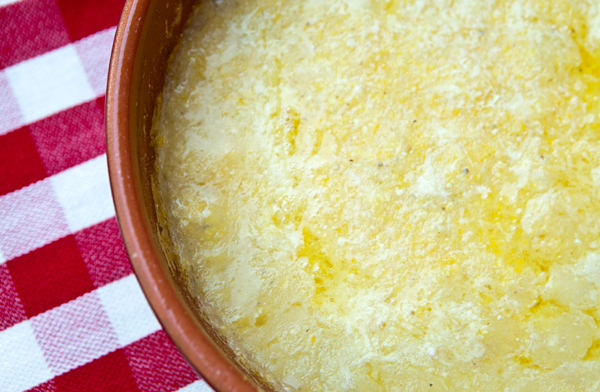 A spoonful of polenta makes a great side dish or platform for stews or braised meats, and is a great alternative to mashed potatoes or rice. There are varieties of “instant” polenta on the market, but I really prefer the texture of the longer cooking polenta, and when you bake it as this recipe does, it is almost effortless. You can use any medium grain cornmeal to make polenta, although for this recipe I used Bob’s Red Mill Stone Ground 100% Whole Grain, Medium Grind cornmeal which I found took a little longer to bake than regular cornmeal. Bake for 45 minutes, then stir well, and bake another 10 to 15 minutes or until creamy and smooth. Let stand 5 minutes to slightly firm, then serve as desired.